III centuries by farmers , millers for five generations. Andria is a major producer of extra virgin oil in Italy. And Miccoli is proud to say that the best quality oil comes from it’s farm. In the mid-1800’s, our great-great-grandfather Mr. Savino Miccoli, worked in the agricultural sector with excellent results. He was the owner of over 70 hectares of land with olive orchards, vineyards , pastures and agricultural land. He spent most of his days in the fields and farms, where apart from cultivation, he also raised sheep, cattle and horses. Those days the people of Andria spent most of their time in the country sides. They were hard working and meticulous. They overcame every problem that arouse due to the limited resources at their disposal. The work was hard and tiring but Mr. Savino, a shrewd businessman, decided to undertake among other activities to start the oil production. In the 1870’s, he devoted himself to the noble art of producing extra virgin olive oil. Even though the oil was produced under his personal supervision, it was important for him to get the appreciation of his friends and relatives. Hence he brought it to their tables at an acceptable price. In this way the oil produced by Mr. Savino Miccoli got the ‘certified’ as the best extra virgin oil. His son, Mr. Mauro Miccoli, our great-grandfather, further expanded the family business by introducing machinery that allowed greater production. He employed a lot of skilled workers both in the cultivation of olives as well as in the mill for the oil production. He had a small millstone (grinder) with 2 wheels, moving on an axis that revolved around the bathtub. After grinding, the olive paste is spread on fiber disks, which are stacked on top of each other, then placed into the press. These disks were made of coconut fiber, unlike those in modern times that are made of synthetic fibers which are easier to clean and maintain. The oil and water mixture was left to settle down in large tanks. Being lighter that the water the oil emerged on the top. Later on it was separated by hand using a jug. Mr. Mauro Miccoli’s son, our grandfather Savino II, took this business of oil production to its greatest heights and splendour. Miccoli farm became one of the most well-known and respected farms of the 50’s and 60’s among the 150 most important mills that existed at time in the city of Andria . Our father Mr. Antonio Miccoli, has carried on this family business of oil production which has been handed down to him from his ancestors. He has devoted his 70 years to this business and until today he continues to work with passion. He has continued to cultivate the family land. He specializes in the cultivation of coratina olives. Due to his immense experience, he knows the appropriate time for carrying out the activities in the various phases of oil production. 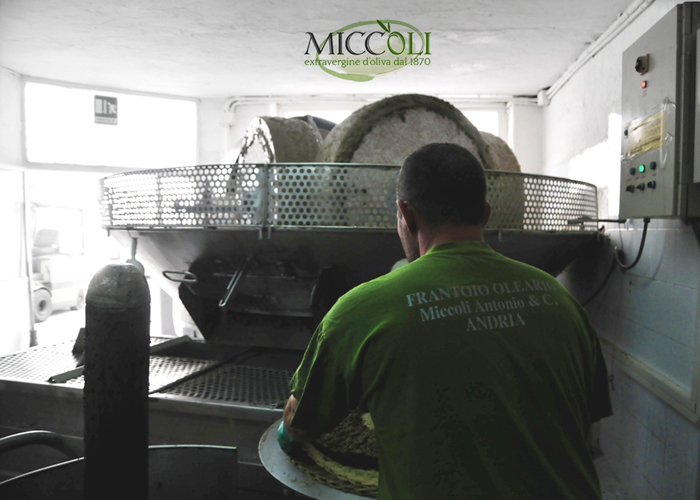 He carefully organises very step so as to get the maximum benefit from the trees and other activities involved in the production of Miccoli’s high quality extra virgin olive oil . He has expanded the mill with technologically advanced machines, while maintaining the system of traditional processing . To obtain a high-quality oil, it is very important to decide when the milling should be done. This decision depends on the right time of collecting olives and other climatic conditions. Hence, Mr. Antonio Miccoli takes the advantage of the knowledge and secrets passed on from to him from generation to generation. He has continued with dedication the family tradition of teaching his children and grand children the profession of a farmer and a miller. In fact, in recent years he has been recognised as an EXPERT in this sector. His numerous interviews with local television channels, especially his interview on Telenorba in 1998 can be seen on this website. His son, Mr. Mario Miccoli has been working in this company and has set his goal to globalize the awareness of “our gold” . His main objective is to raise this awareness not only among the inhabitants of Andria or among Italians but to make it known to Europe and to the world about it. We treat the earth well: it not been given to us by our fathers , but there has been paid by our children. Copyright © 2015, Designed by STASBRANGER.